Quick, Someone Call the ASPCA! 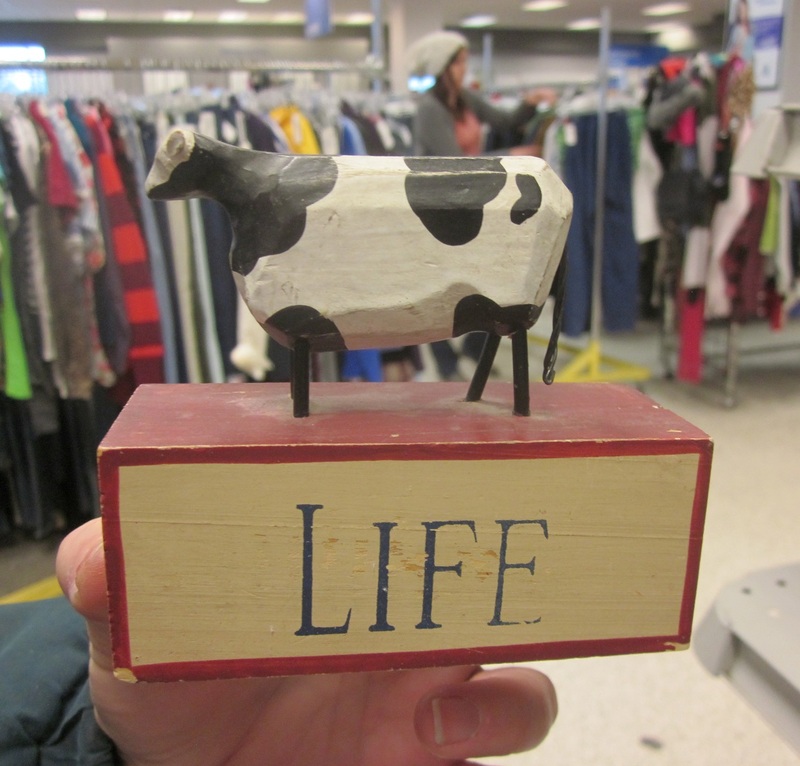 Since when did cows = LIFE? Kathy picked this up, and the price tag was covering the letters FE. Of course she peeled it back to see what was under there; we were gobsmacked by LIFE. There are lots of words that would have made more sense: LICK, LIPS, LIMP, LIQUID, LIMPID, LIKE, and LINE. I guess LIVESTOCK could be your LIVELIHOOD, but those words are much too long. 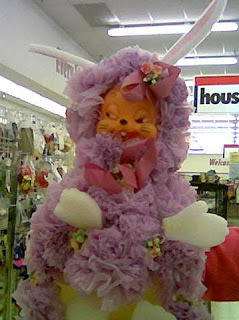 I’m pretty sure this cat would scratch you to ribbons if you got close enough. 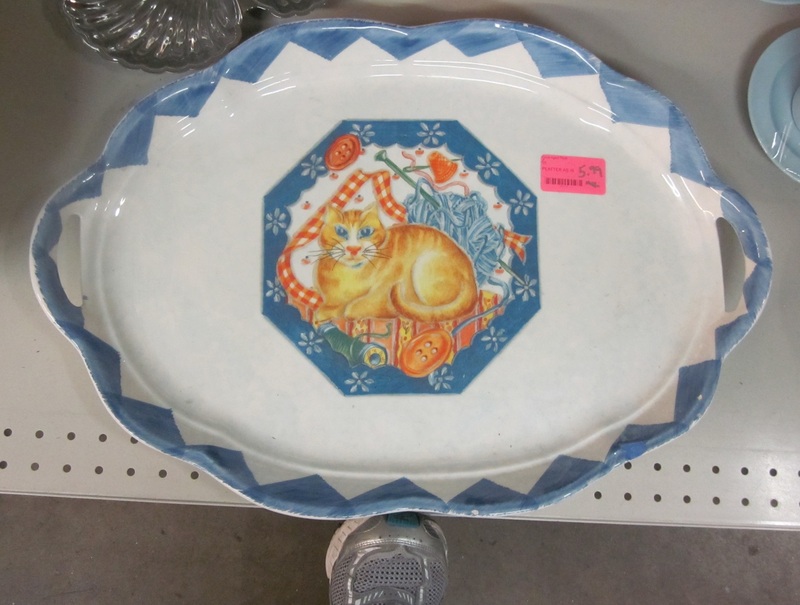 This pottery tray was more than two feet across, and after it was loaded up, you would have to be Superman to lift it off the counter. Definitely know why it was at the thrift store. I hate to be crude, but doesn’t it look like they have hickies on their necks? Must have been some reunion! 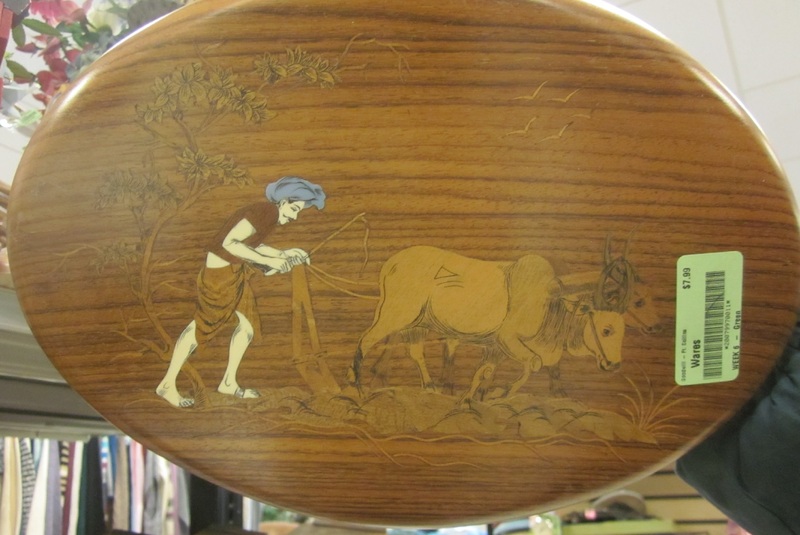 I don’t know who looks more tired–the man or the oxen? It’s not something that I would want to look at day in, day out. In fact, I don’t want to look at it any more! 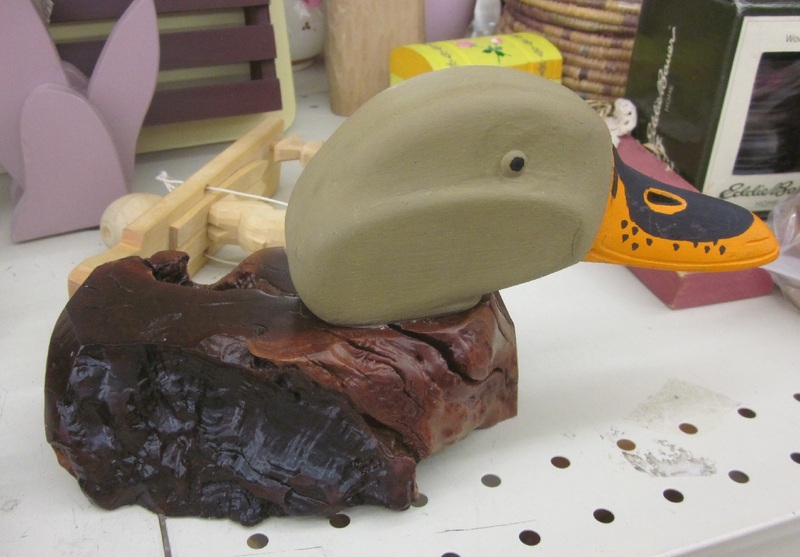 I have a couple of questions about this duck. What happened to his body, and are you sure that’s the color you want to go with for his bill? If you happened to use this duck for target practice, you would have twice as much incentive to hit it with both barrels! These foul fowl looked to be possessed by demons what with their red eyes and all, but I think it was just an untalented artist hitting their skill ceiling. An alternative explanation could be the artist was taking LSD; take a look at those tails! I don’t have much hope for those poor little chicks. This plaque is crying out for an upcycle; hopefully a repaint is in its future. 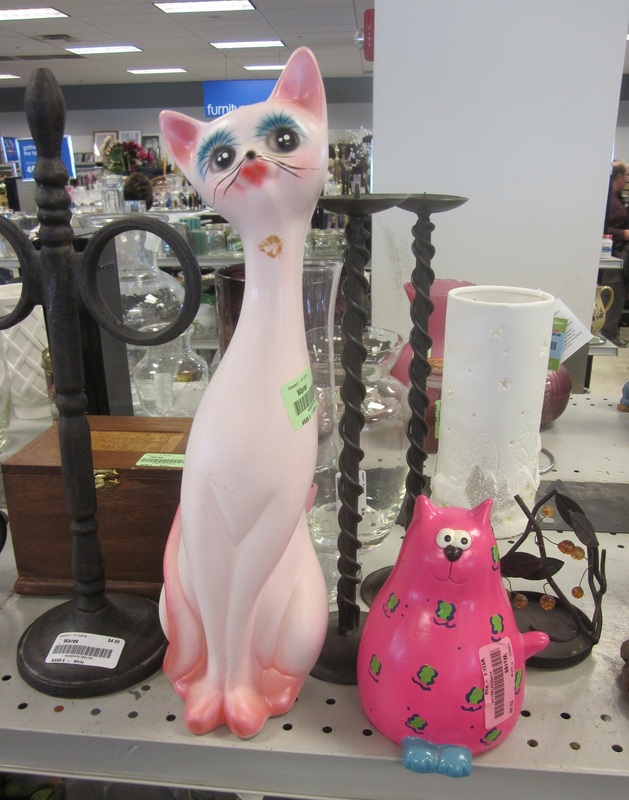 This bowling pin had a cute makeover. We loved the goofy flying ear and big, happy smile. He even had a cute tail painted on his back. 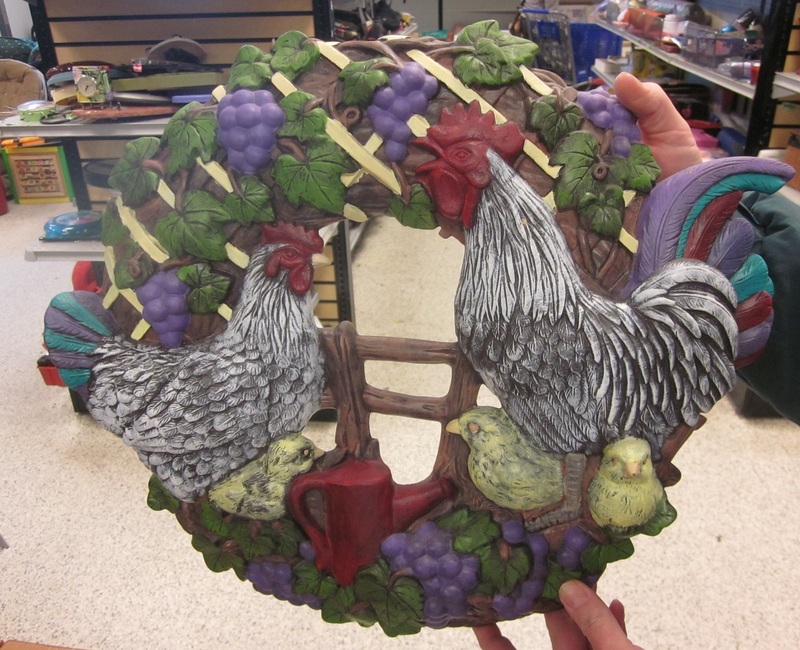 Too bad we couldn’t hunt down this artist and hand them the chicken plaque! 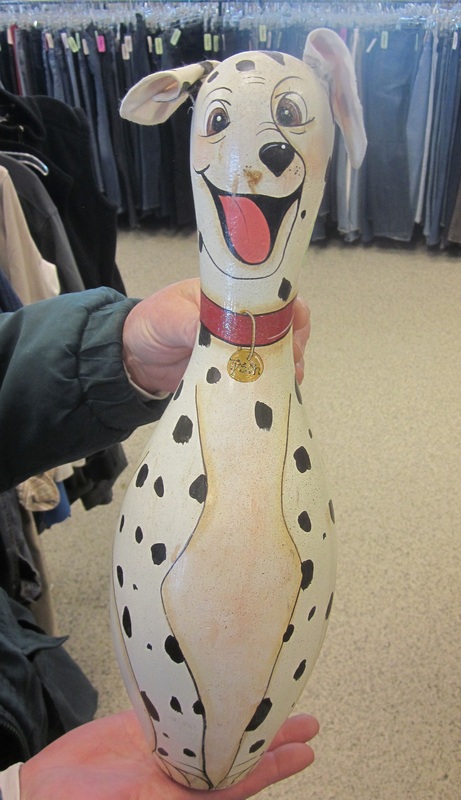 I was so tempted by this dog, but bowling pins are awfully big and heavy. We were surprised that it was there for a couple of weeks before finding a home. 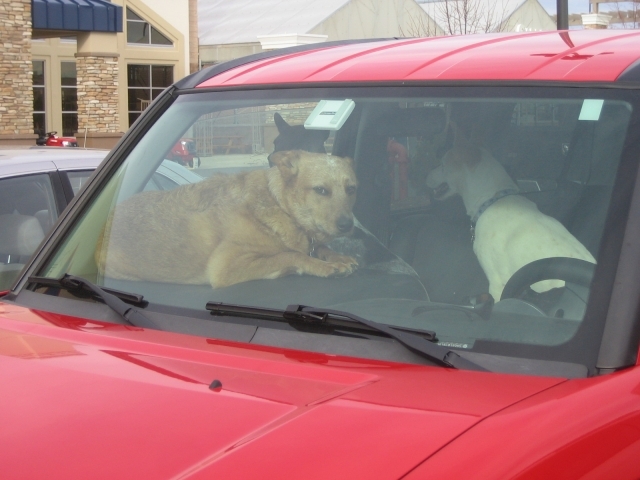 That vehicle looks like a doggy clown car–how many dogs are in there? 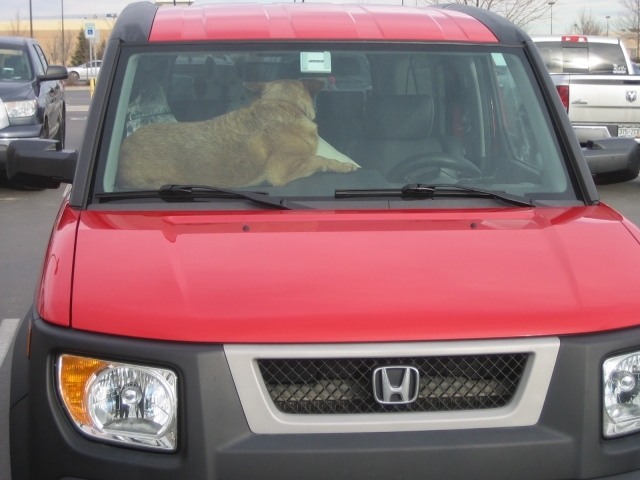 Poor fella has to wedge himself onto the dashboard to escape the mayhem! If you haven’t entered our flower pin anniversary giveaway you have until noon Friday (3/14) to do so by commenting on this post or our Facebook page. Poor Kathy is moving AND shopping alone for the next two weeks while I’m off cavorting in Florida. Facebook posts may be a little chaotic, but the Friday posts will continue as usual. I might even do a trip report, depending on what horrors I run into at yard sales and flea markets. 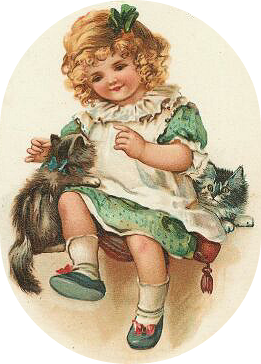 This entry was posted in Friday Finds and tagged Animals, Cats, Dogs. Bookmark the permalink. 10 Responses to Quick, Someone Call the ASPCA! Heading in for surgery today…this was the perfect way to start the day! Just when I thought it couldn’t get any better, you add a clown car of dogs!!! PERFECTION! 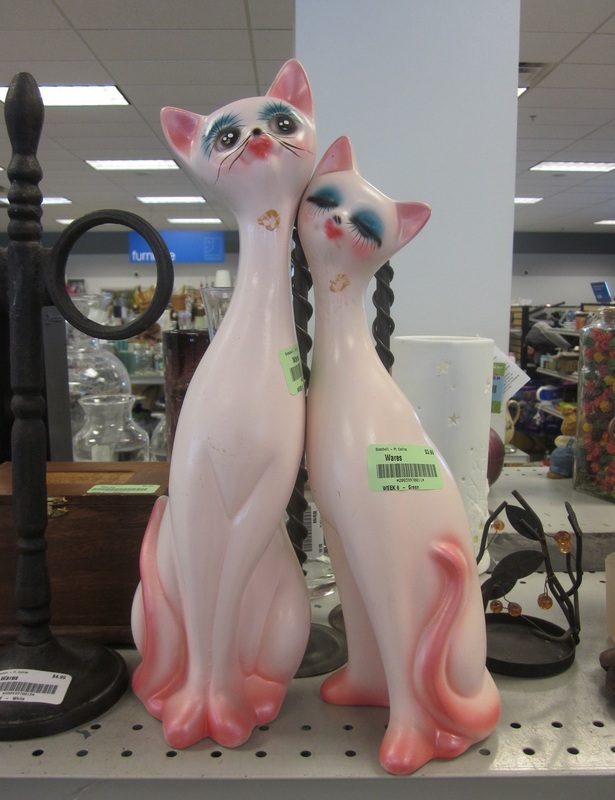 Happy Friday – continued good thrifting finds…you make me smile! Good luck with the surgery Tanya! Glad we could give you something fun to think about for a while! We wondered if the duch head hadn’t broken off something and then been melded with a weird piece of burl wood–it’s just totally wrong! I’m so glad you put the two kitties back together! I do that sort of thing all the time. Actually, my friend Rivka and I were having a giggle at the Arc last Saturday, gathering up all of the flocked bunnies in the Easter section and putting them together, so it looked like they were multiplying! That head almost gave me a heart attack!! That hair and those eyes are … words fail me and as you well know that doesn’t happen often. 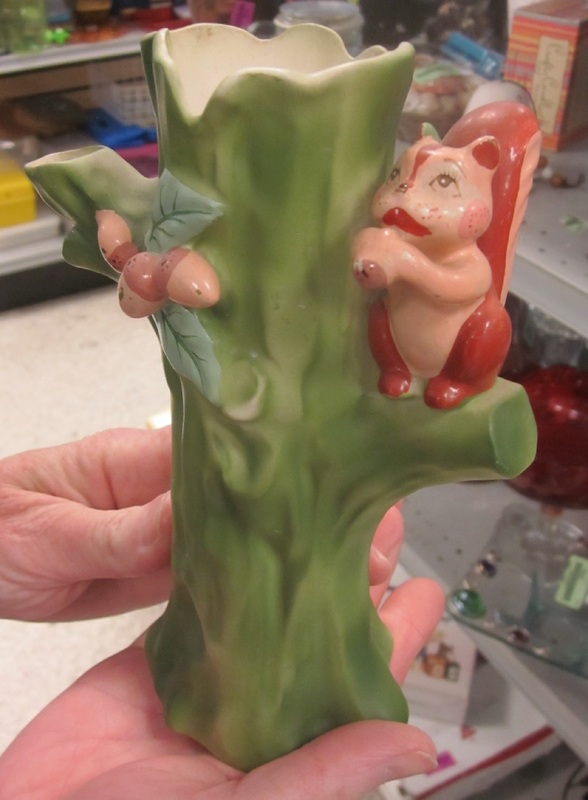 Glad someone else reunites things at thrift stores; I bet the bunnies were pretty funny all together. Thanks for reading Shelia, and btw you “won” one of the pins–yay! 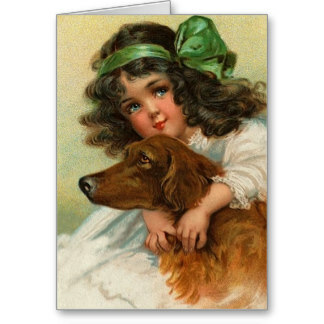 Love your St. PATRICK’S Day pictures with the little girls and their pets! Thanks Karen–I thought they were adorable too!